Hi there, Gaylynn here. We have an inspirational prize filled blog hop for you with design teams from Unity and My Sweet Petunia. 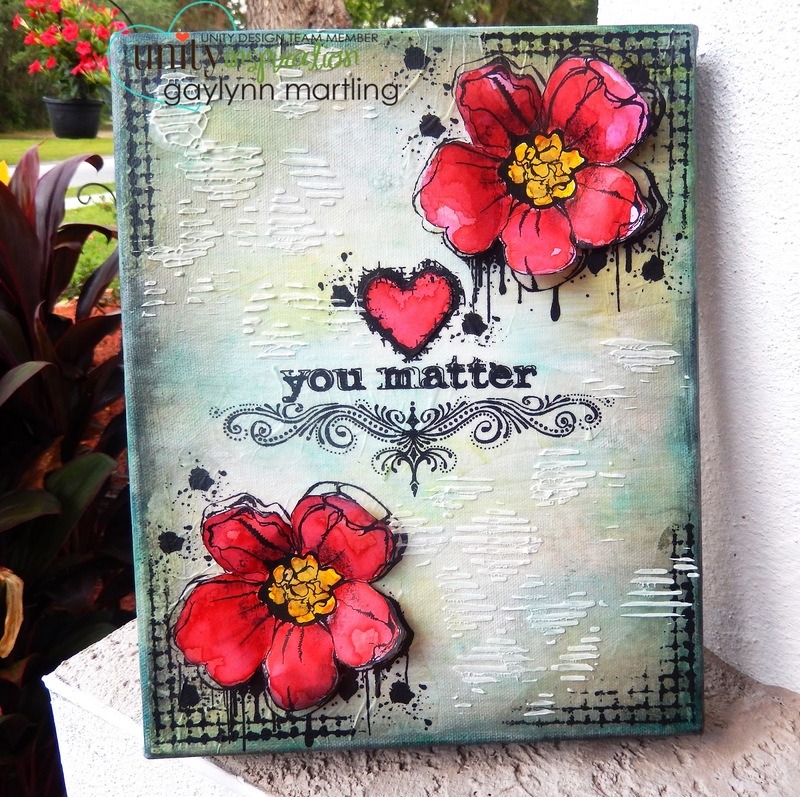 Today, I am sharing a watercolor mirror image stamping project and an image transfer journal page. Sentiment: If love was water, I'd give you the sea. For this co-hop, we are focusing on the amazing Misti stamping tool by My Sweet Petunia. I must say, the Misti has revolutionized the stamping industry. Today, I have a watercolor card with kissing fish. 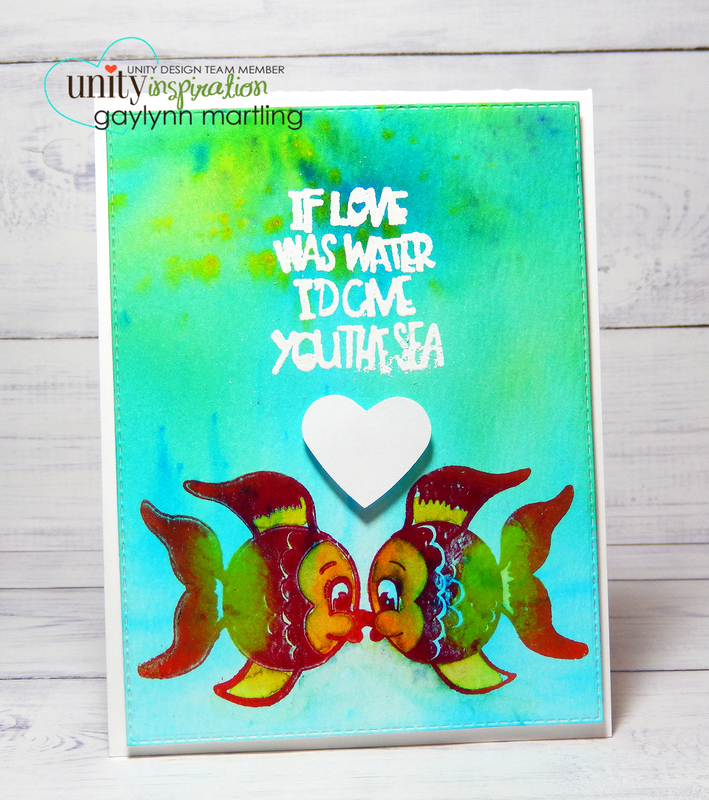 It was made using the brand new Mirror Stamping Tool by Unity, the stamp kit Give You The Sea and the Mini Misti. I used one fish stamp and one sentiment. With the mirror tool along with the Misti, I created a second "mirror image" fish, so that they face each other. In this case, kissing. Awe. I suggest stamping on the smooth side of the watercolor paper for the best stamping impression. I made a quick tip video tutorial for these kissing fish. Sentiment: Lift up your eyes on high and behold who hath created these things. Isaiah 40:26. For this watercolor bible journal page, I used the Original Misti, the Unity Mirror Stamping Tool and Lift Up Your Eyes by Phyllis Harris to create an image transfer to my journal page. For more projects like this, I have a series of bible journal posts, trying out different ways to create on the thin pages. The same techniques can be used in planners, journals, cards, tags and mixed media. 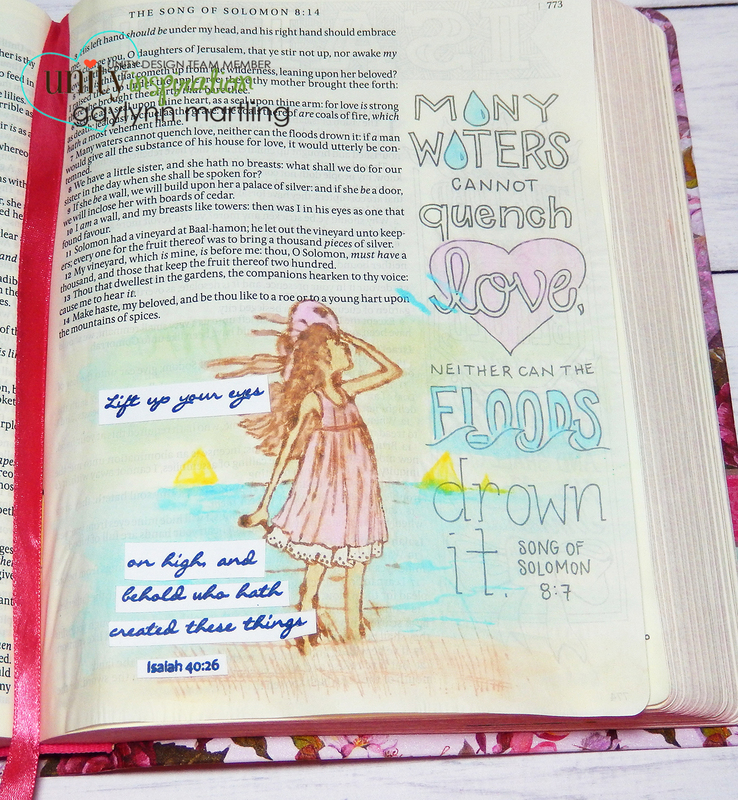 Here is a quick tip video for this bible journal page. Everyone who leaves a comment on all of the blogs in the hop will go into a drawing for 3 prize packs from Unity Stamp Co. and the winner's choice of an Original or Mini Misti. Please leave a comment by May 30, 2017 at noon Central time to be eligible. Winners will be posted on both the Unity blog and the My Sweet Petunia giveaway page on May 31, 2017. Thank you for stopping by. I look forward to your comments. Hello, it's Gaylynn. Today, I am up on the Mixed Media Mojo Challenge blog as Guest Designer with this mixed media style wedding card. Many thanks to the sponsor Everything Mixed Media. 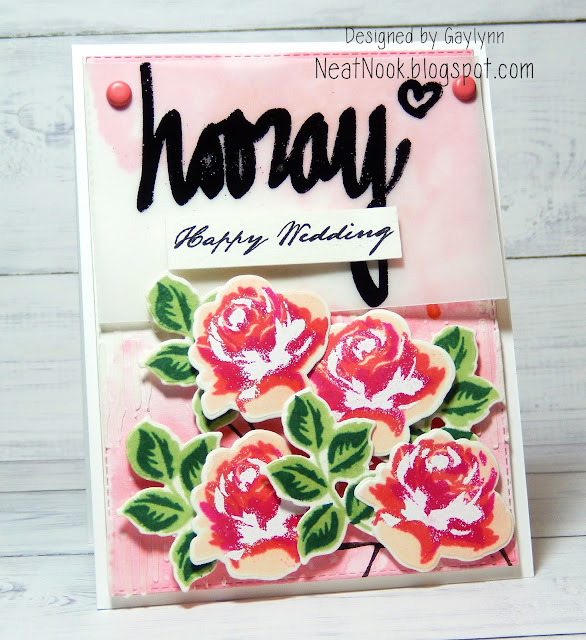 For my project, I added a distress oxide watercolor background, wet embossing with a stencil and modeling paste, dry embossed sentiment panel and roses, as well as stamped die-cut flowers and leaves. Supplies: Altenew Vintage Roses stamps and dies, Vintage Flowers, Super Script 2 and Sketched Lines Stencil; Liquitex modeling paste, Tim Holtz distress oxide ink, My Creative Time dies, VersaMark, embossing powder, heat tool, vellum, Ranger archival ink, MFT ink, foam tape and brads. This is a mixed media home decor art project with an encouraging reminder. This is filled with some of the Unity new releases. I used a mix of techniques for this canvas, including, watercolor, distressing, embossing, 3-D flowers and tissue paper stamping. I made a quick tip video tutorial for it. I you have any questions or would like to see a particular technique featured, please comment or message me. Supplies: Unity Stamp Co. kits by Jolande and Marleen You Matter, Hello Beautiful and You Can Do It; Ranger archival ink, distress ink, distress markers and watercolor paper; Sakura Koi watercolors, tissue paper, Liquitex modeling paste and gel medium; Artists' Loft 8"x10" deep edge canvas, Gesso, Altenew stencil, blending tools and brushes. Here is an encouragement watercolor card. Sentiment: Kindness matters. You matter. For this card, I used layers of watercolor, background panels and sentiments. I made a video tutorial focusing mainly on my watercolor technique using Sakura Koi watercolors. Supplies: Unity Stamp Co. Lauren Girl and Unleash Your Happy 5/2017 SMAK, Sakura Koi watercolors, paint brushes, Ranger archival ink and watercolor paper, paper punch and foam tape. 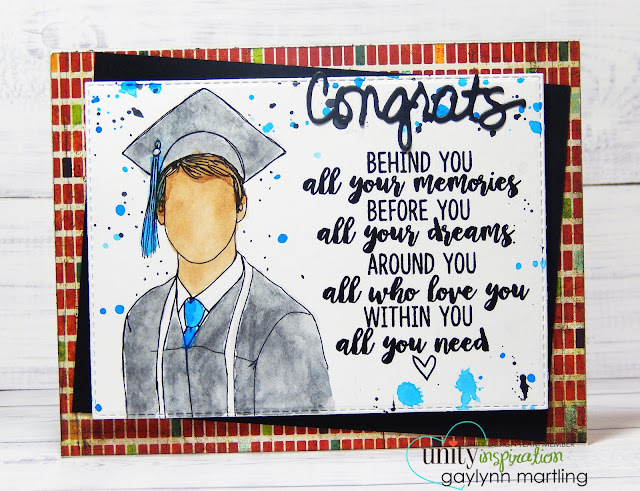 Here is a masculine grad card in watercolor. Congrats. Behind you, all your memories. Before you, all your dreams. Around you, all who love you. Within you, all you need. I made a quick tip video tutorial on this watercolor card. I recently made a girl version of this design here. Supplies: Unity Stamp Co. You Did Good and Sentiments for Graduates; Sakura Koi watercolors, My Creative Time dies, Ranger archival ink and watercolor paper. Today, I have a framed and layered thank you card with daisies. Sentiment: Thanks. You warm my heart. For this card, I highlighted the daisies, with minimal color, mostly shadows. To make them stand out on a card, add shadows in shades of gray, especially on the outside of the flower petals. I framed the image panel and then layered the elements on this card. A few sparkly gems were added. I have a quick tip video tutorial showing how to make simple layers and frames as accents. Supplies: Unity Stamp Co. Free Your Dreams May 2017 Kit of the Month, Copic markers, adhesive rhinestones, My Mind's Eye paper and foam tape. Today, I am up on the Unity blog with new release projects, including this one with a sunrise or sunset sky. 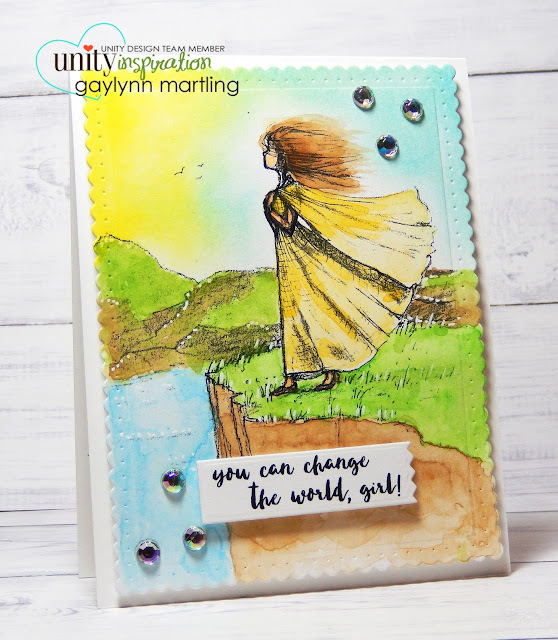 Sentiment: You can change the world, girl! For this Phyllis Harris image, I used watercolor for everything but the sky. For the sky I used distress ink and a foam blending tool to make a sunrise or sunset. I think this is an empowering encouragement card, for graduation, good luck, promotion and more. Supplies: Unity Stamp Co. Beauty In Everything by Phyllis Harris, Winnie and Walter and Lil' Inker Designs dies, Sakura Koi watercolors, Ranger distress ink pad, adhesive gems and foam tape. Hello, it's Gaylynn here with a post for the Unity Stamp Co. blog hop. This sweet mama and baby giraffe is from the kit Finally Here by Tierra Jackson. This card was made for my niece's daughter and for her first birthday party. So, I personalized it by adding her name, Jadyn, (not part of the kit). I made a quick tip video tutorial on the bow and button embellishment for this card. And here is a closer look at the sweetness. There is an amazing 9th birthday sale in the Unity shop. After hopping with us, go check it out. We have TWO amazing Unity filled prize packages to giveaway. Leave a comment on EACH blog in the hop (including the Unity blog) for your chance to win. This card is sure to make someone's day. Who wouldn't want to hear this? Sentiment: I don't think you realize how amazing you are. I love anything tropical. When I saw this beautiful scene by Phyllis Harris my heart went pitter patter. I used watercolor and accented with this AMAZING sentiment tag, die-cuts and background trimmings. Daydreaming at its finest, right there. Here is a quick tip video focusing on the accent trims for this card. Supplies: Unity Stamp Co. Realize It by Phyllis Harris, My Creative Time dies, Sakura Koi watercolors, foam tape, paint brush, ribbon, Ranger watercolor paper and Archival ink.